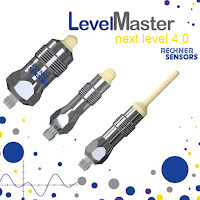 The new Smart Paddle sensor from Rechner promises to keep level control easy. This capacitive sensor is designed to work in almost the entire range of dielectric constants (2 to 80) without adjustment out of the box. This is all due to the brand new, unique, patent pending sensor design and is 35% less expensive than a standard M30 high performance sensor. The advantages are obvious: Easy installation and reliable level control that solves the well-known issues of mechanical systems being used today. No more down time due to false detections caused by material build-up, or material getting stuck between vibrating forks and rotary switches. Mounting style G1/2” or ¾” NPT. 10-35VDC, PNP with a switchable anti valent output.